A very useful source in learning about chopper mittens (and other Native handiwork) is: Crafts of the North American Indians; A Craftsman's Manual. (pg.s 95-104). Written, illustrated & published in 1972 by Richard C. Schneider, 312 Linewood Ave., Stevens Point, Wisconsin 54481 ISBN: 0-936984-00-7. Musuem & the Cranbrook Academy of Art/Musem (1981). 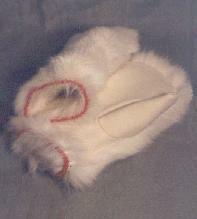 Simple chopper mittens are not too difficult to make for someone who has a little experience in sewing with leather. The most involved part is sewing the thumb-piece to the rest of the mitt. For sturdy chopper mittens, I prefer to use a heavy elk or moose hide in a 4-6 ounce weight (leather weight is measured by how much it weighs per square foot). If the mittens are to be worn for work, they should afford both protection for the hands and durability so they will last. However, lighter weight leather or deer hide can be used if your purpose is make mittens that are for special dress, and not for chopping wood. The mittens pictured to the left are Ojibwe made, from the Chandler-Pohrt Collection. 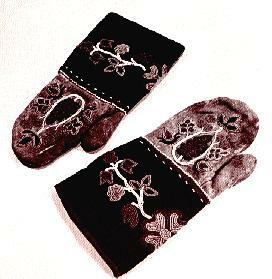 These mittens are made of deerskin and wool cloth with military braid binding. The elaborate sewn beadwork is done in a traditional eastern woodlands floral pattern. The basic pattern for the trank of a mitten is fairly easy figure. 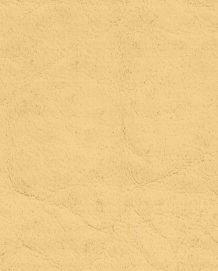 Lay your hand flat on a piece of paper with your thumb flush against the rest of your hand. Although the mitten can come as far down your wrist as you'd like, generally the mitten should at least reach just below the protruding knuckle of your wrist. Trace around the perimeter of your hand, leaving at least a half inch on the pinkie side, a half inch over the finger tips, and a half inch on the thumb side. The bottom of the mitt at the wrist should be flared slightly to make it easier to slip the mitten on and off. to see how much to round out the top of the mitten, spread your finger tips about a half inch apart from each other, you should still have a half inch from the edges of your finger tips to the edge of your pattern. with the gouch for the thumb hole. this curved on the palm line should be identical to the inside curve of the thumb gouch pattern. The back side of the trank is simply a mirror image of the palm side. 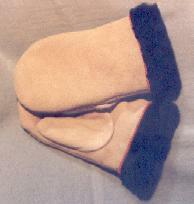 One-Piece Mitten trank pattern showing inside of left hand of chopper mitten. Note: The entire trank for the mitten can be made in one piece to reduce the amount of sewing, although it would take bigger pieces of hide. In this case the seam sewn around the perimeter of the mitten would be much shorter as shown in the illustration to the left. Whether you cut the trank for the mittens in one piece or in two separate pieces, it is best to orient them on the hide in the same direction - re: the stretch in the leather is going in the same direction with each piece of the pattern, otherwise you may end up with one wide-short mitten and one long-narrow mitten. The pattern for the right hand's trank palm, trank back, and thumb pieces are simply a mirror image, or reverse, of the left hand. Make *sure you mark all pieces of your patterns Left Hand and Right Hand and also note on the patterns 'inside' and 'outside'.
. All in white, with red beaded edging joining the liners to the mitts at the wrist. You can either sew the mittens right side out, or inside out, if you sew them right side out the stitching will show. It is definitely less confusing to sew the mittens right side out, in which case you might want to stitch them together using the blanket stitch and colored thread. With practice, you may prefer to sew the mittens together inside-out, as they are more durable, using either the whip stitch or the blanket stitch. Schneider's book Crafts of the North American Indians; A Craftsman's Manual. (1972) has excellent instructions for sewing chopper mittens together using a welt which reinforces the seam, as well as other variations on how to sew this type of chopper mitten together. In any case, a heavy waxed nylon thread (imitation sinew - in lieu of genuine sinew) is recommended to sew the mittens together. If you are using heavy elk or moose hide, you will likely need a glovers needle (a special needle for sewing leather which is available at fabric stores). A standard needle can be used on most light weight leathers and for the liners. not only does this serve as a check to make sure the pieces fit properly, it also helps to keep the one piece of leather from 'creeping' while you are stitching along a seam. this will look like your thumb piece is upside down, but bear with it. Line up the points #1 and #3 on both thumb piece and gouch and staple or pin between these points to keep it from slipping. It is very important that the point at #2 is aligned correctly.
. It is O.K. that a point of leather protrudes at point #1, as this is where you will end stitching the thumb, if the point protrudes too far at when you complete sewing the thumb, you can trim it off then. Sew from point #1 to point #2 and take several stitches around the tight corner here, as there is a lot of the stress on the seam here when wearing the mitten. Continue sewing from point #2 to point #3 and end your thread there with a knot on the inside of the mitten. if a tiny point of leather projects too far here you can trim it back just before you take the stitches there. lines up properly with the gouch hole. If you have too much material on the thumb piece, carefully trim off material from the bottom curve of the thumb piece until it fits properly with the gouch hole. It is wise to pin or staple the remainder of the thumb & gouch so the leather does not creep as you sew. Now, continue sewing from point #5 around around base of thumb past point #6 and back up to point #1 where you began. Congratulations!! You just finished the hardest part of the mitten, sewing the thumb! All that's left now is to sew around the perimeter of the trank. If you have a one-piece trank, you would fold it in half and only need to sew from the top of the mitten down to the base. Make sure you keep right sides together, and pins or staples will help you keep the leather from creeping.